Design has evolved significantly from just having a basic porcelain rectangular hole and a standard tap in the kitchen counter. Everyday life today demands a lot from your kitchen. Luckily, we have so many conveniences that help expedite meal planning and prep time. We even have a variety of ways to make meals in 30-minutes or less, but what good is that if the mess takes an hour to clean up? Un-think your sink by remembering it does more than wash dishes and hands. Keeping prep confined to the sink area makes clean-up of leftover meal ingredients much easier and streamlines washing of non-dishwasher items such as steak knives and specialty glassware. One sink; numerous functions. Prolific sink series photo courtesy of KOHLER. If you have ever felt limited by a sink you chose for style underestimating what you would actually need it for, you are not alone. And sometimes even a standard double-bowl sink has its drawbacks. So if you are building or planning a re-model, take some time to assess what you need from your sink. 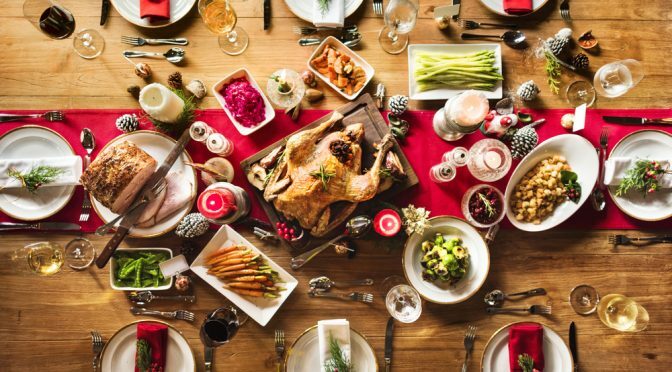 If you’re the family that does most of the big dinner/holiday hosting, you may wish to consider a model that offers more. This fireclay kitchen sink offers a colander add-on for easy rinsing and draining of food and a custom cutting board that offers a convenient surface for prep and cleanup. Photo courtesy of Bocchi. While many current kitchen plans do boast an additional sink in an island across from the main sink area, you may wish to reconsider how placement affects the utility and efficiency of this area. 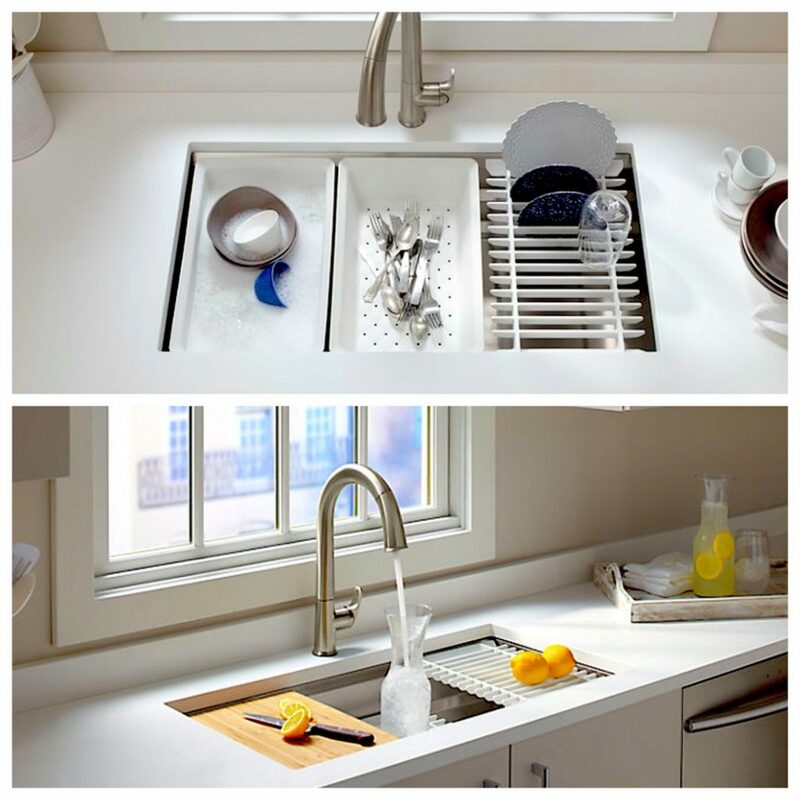 The option above locates that extra sink right next to the main sink, but does so beautifully so the area does not look overwhelming but functional; clean and well organized. Being able to hide dirty dishes from guests under the covered sink portion is also an enormous benefit! The stainless steel sink above provides a washing, rinsing and drying area; especially practical for after-party cocktail and wine glass clean up. Photo courtesy of FRANKE. 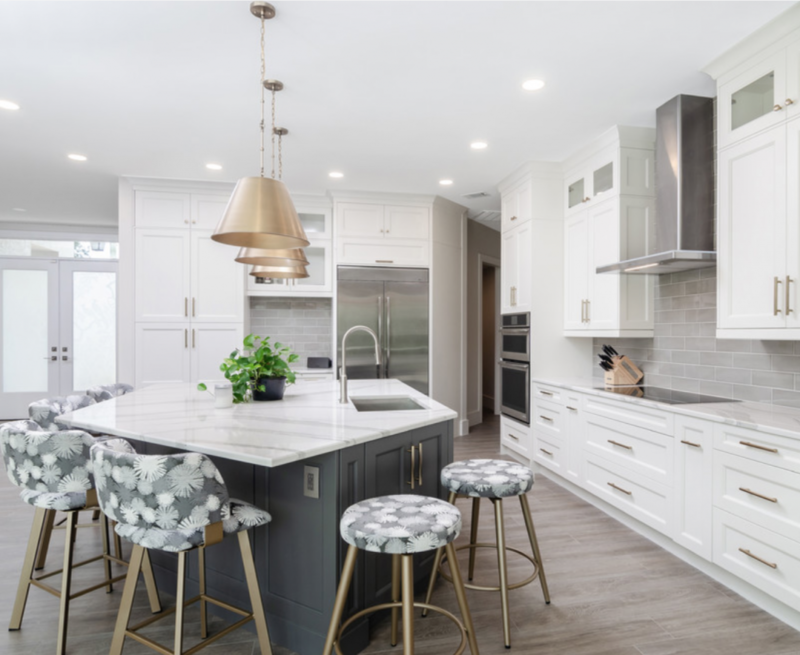 Innovations have allowed homeowners to choose from a variety of accessories that turn what once was a place to just wash dishes into a total meal prep, clean up, and entertaining center. 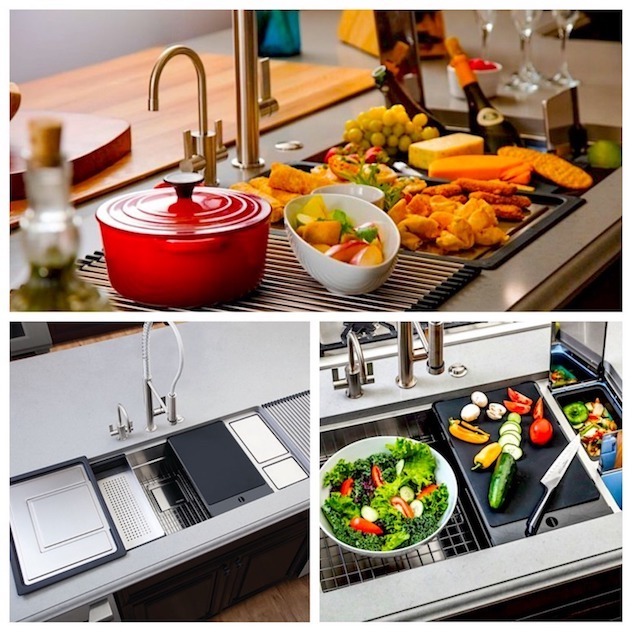 Enhanced sink workstations are available for the most discerning of home chefs. These smart designs can then be re-configured for the entertaining portion of your evening. Photos courtesy of FRANKE. 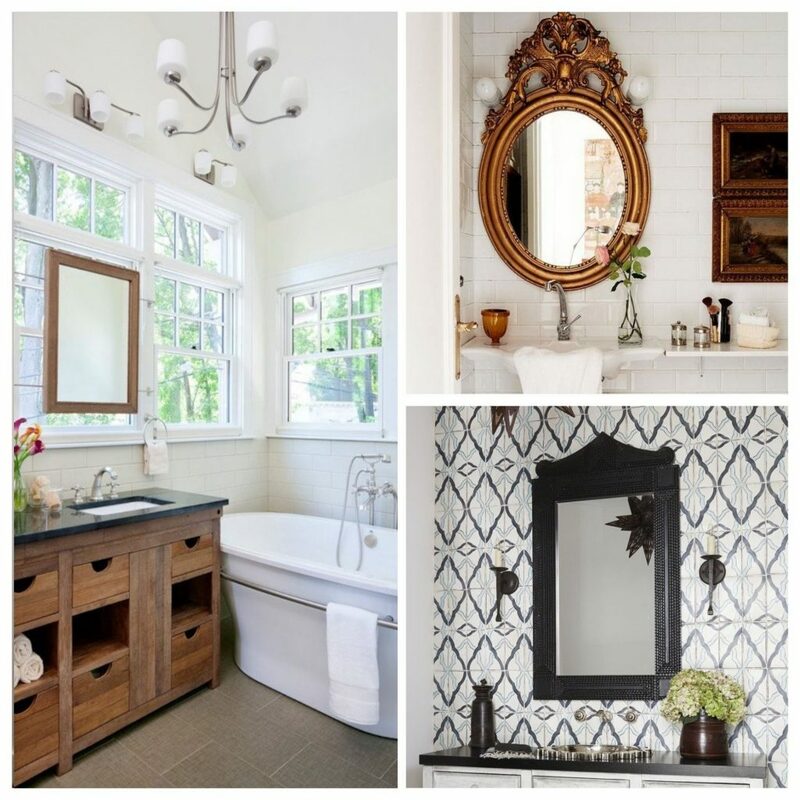 Whether you’re looking to add some posh to your powder room or amp-up your main or master bathroom this year, bathroom designers are at the ready with their predictions of what’s new and what’s cool. 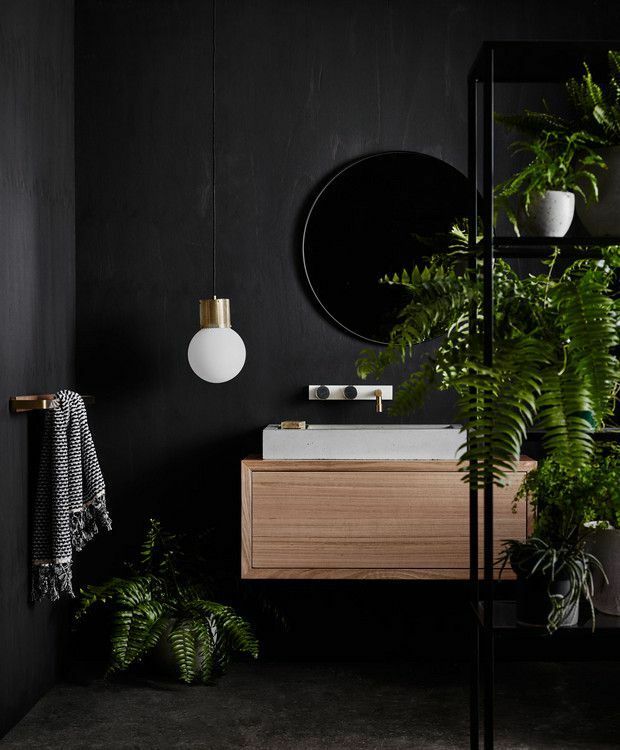 The Moody Truth: White bathrooms are always on trend, but you may be surprised to learn that in 2019, bathroom style is moving to the dark side. But to do it right takes some finesse. 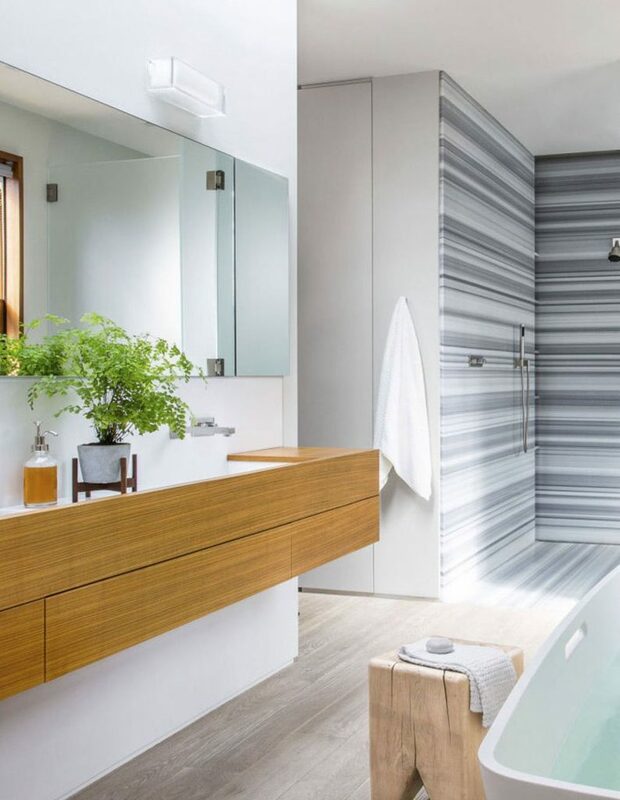 If you’re already a fan of bold design but have been a bit timid about how to make it work in a bathroom, bathroom interior designers in the know say now’s the time to go for it. And the bolder the better, like this all-black bathroom. Going dark and sultry is a great way to achieve the high-end, indulgent experience that’s trending for 2019. Prime Personal Pieces: Unique statement pieces will remain a hallmark of inviting bathroom design in 2019. This trend may be the perfect solution to finding a creative way to showcase a family heirloom that you just love but don’t have a place for, or for that sweet flea market find you just had to have. 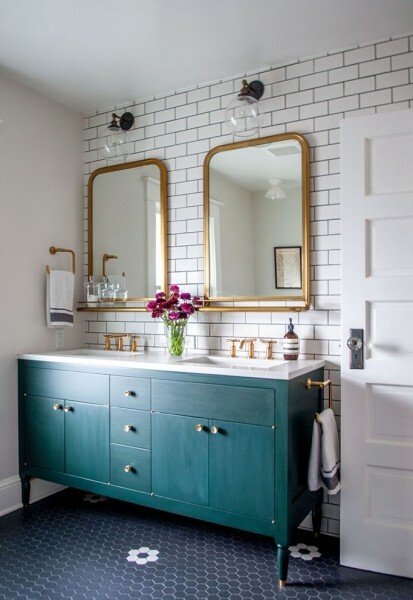 Today’s most eye-catching bathroom vanities are those that once had another life—perhaps as a turn-of-the-century washstand or even a mid-century modern dresser. Just think of the possibilities! 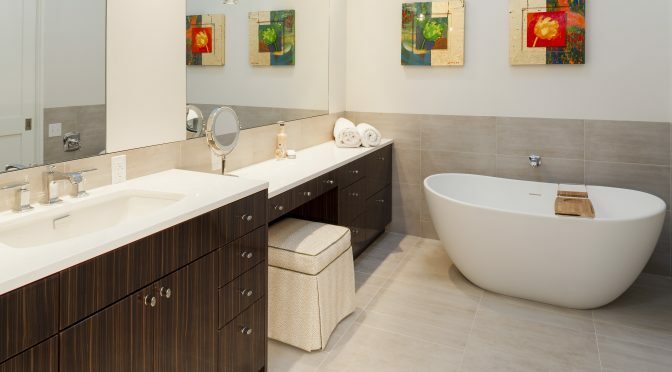 Beyond Shelving: One thing every homeowner wants is a bathroom with lots of storage. Satisfying this need without having the bathroom look like a product salon or a wall of drawers can be a design challenge. Voila! Enter the storage ledge. This covert, slim and sleek vanity style does double duty as both a design element and a clever clutter keeper. So keep that deodorant and blow dryer handy—just don’t keep it on your countertop. The Tex Mix: Porcelain. It’s beautiful—and for some it’s the one and only bathroom material out there. And the thought of swapping that out for other textures like concrete and plaster is…brrr; right? Not so, say bathroom designers who are warming up these colder materials by combining them with warmer woods. 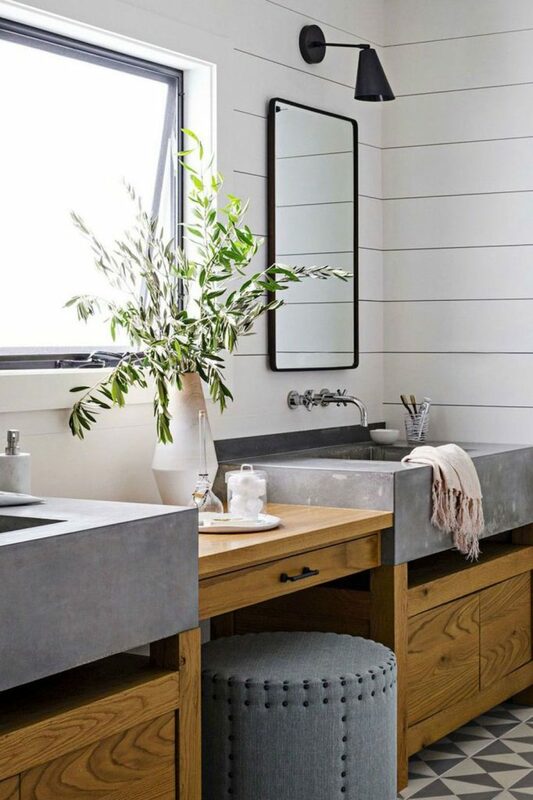 Incorporating concrete sinks into a wood base and framing the room with natural light makes this functional and durable vanity modern and fresh, not grey and dreary. Statement-Making Mirrors: Another great way to inject your personal touch into your bath or powder room is to display a show-stopping mirror. What’s awesome about this option, is just that—the options are endless. And with some imagination, you can even use the mirror to be the design inspiration for the entire room. Ready to make some beyond-basic bathroom upgrades? Call 314 Design Studios today to schedule a no-cost consultation (410) 643-4040, or feel free to drop-in at your convenience. If yours is the home that everyone visits for Thanksgiving dinner, you are well aware it’s going to be a long day filled with cooking, serving and cleaning. Imagine a Thanksgiving that affords more time for conversing, socializing and bonding with your loved ones. Through innovation and smart kitchen design, you don’t have to just imagine…because smart design can help you save precious time from prep to clean-up! Get smart about storage. 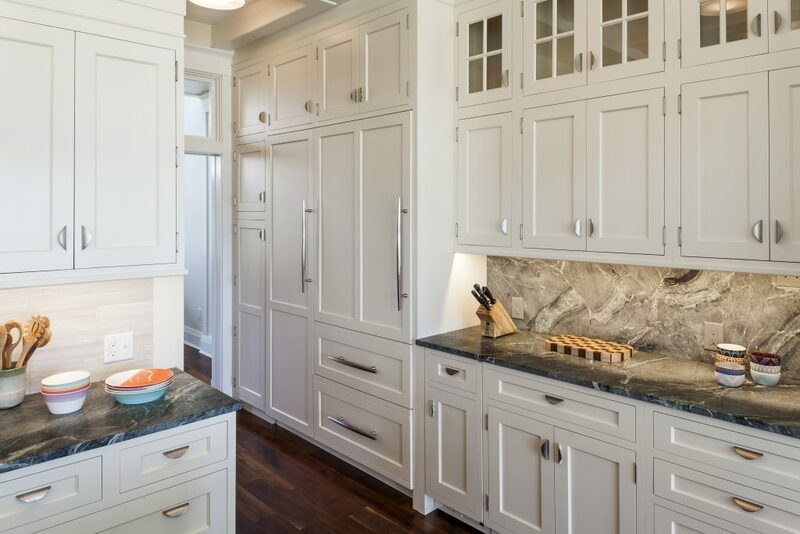 Consider carefully not only how much cabinetry you have, but how it will be configured—the ratio of that all-important lower cabinet space, with upper and vertical spaces. In other words, ask your design specialist about the latest innovations in storage that go beyond just having lots of drawers and cabinets. Using various spices to create all your special holiday recipes? Searching through a carousel can be tedious. Find them faster with a spice drawer inset kit that keeps them at your fingertips and placed so they are easy to read and grab. 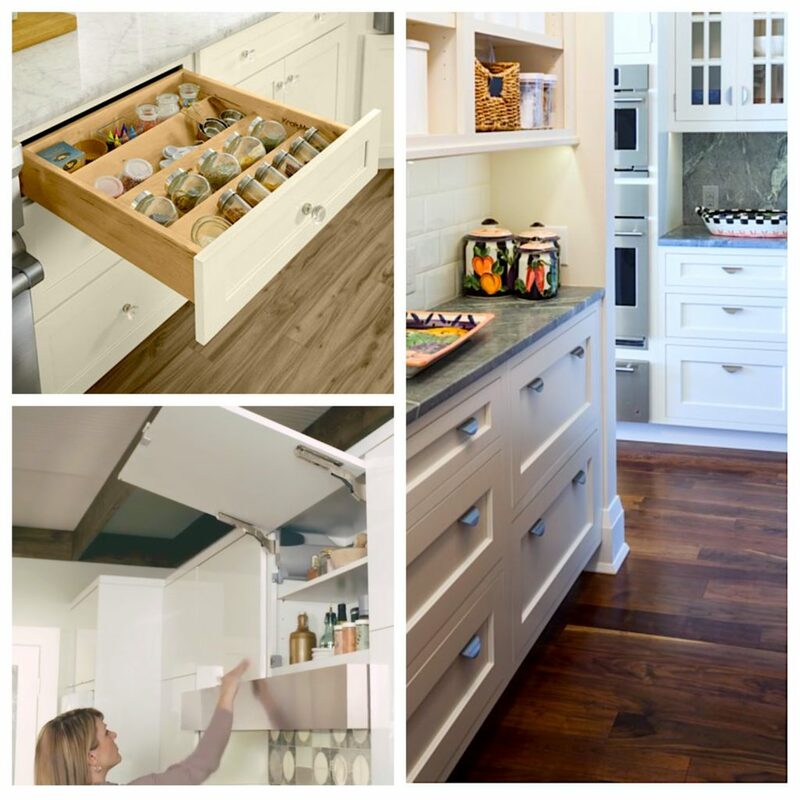 Smart design can also help out in those Thanksgiving moments when your hands are too full or wet and you can’t easily open a drawer or cabinet. The latest in auto-open technology allows you to open cabinets and drawers with just a gentle nudge and then close them with just a slight touch. You may also want to consider this feature for cabinets in those hard to reach places; like where that heavy-duty, but seldom used, roasting pan is stored. Get double the lovin’ from a second oven—and have everything warm and ready to be served at the same time. No easy feat when you have a single oven, unfortunately, and when you consider that big juicy bird is already taking up all the room. And you can forget about adding side dishes or dishes that require different cooking temperatures. Who hasn’t had this holiday hosting problem? Having that second oven is a sensible solution that could come in handy throughout the year. Think about how nice it would be at Christmas cookie baking time, or when you’re really getting your Julia Child on and trying your hand at a soufflé and a rack of lamb simultaneously. And if you have more than one cook in your kitchen, this option actually becomes more of a necessity. 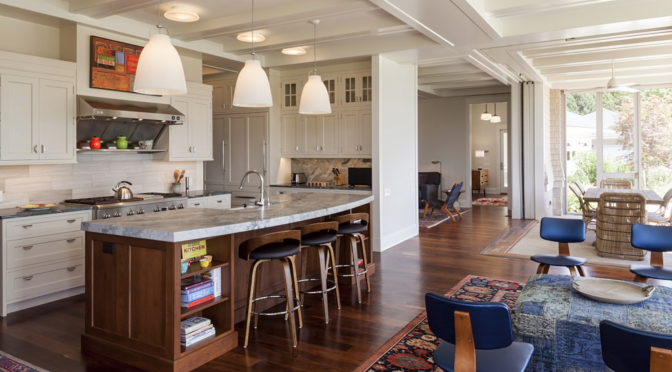 Consider a two-tier or dual level kitchen island so you can be still be in all-out prep mode while your island is pulling double-duty by providing serving and/or buffet space for cocktails and those all-important pre-meal appetizers. And while the lower level is serving, the upper level provides visual relief from the whirl of activity going on at countertop level. Entertaining aficionados may even wish to consider keeping guests from your kitchen’s hustle and bustle by planning a separate area within your kitchen space to include a dedicated cocktail serving and gathering station, complete with a wet bar, wine fridge, multi-level counters and convenient seating. If the party’s always at your house, why not consider this first-class hosting option? Once waged, this battle is seldom won without porcelain scratches and the spillage of wayward rinse water. 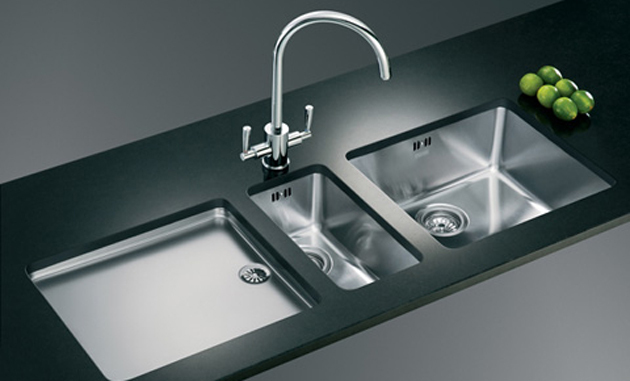 Fortunately, beautiful and functional larger sink options abound and have become increasingly popular. 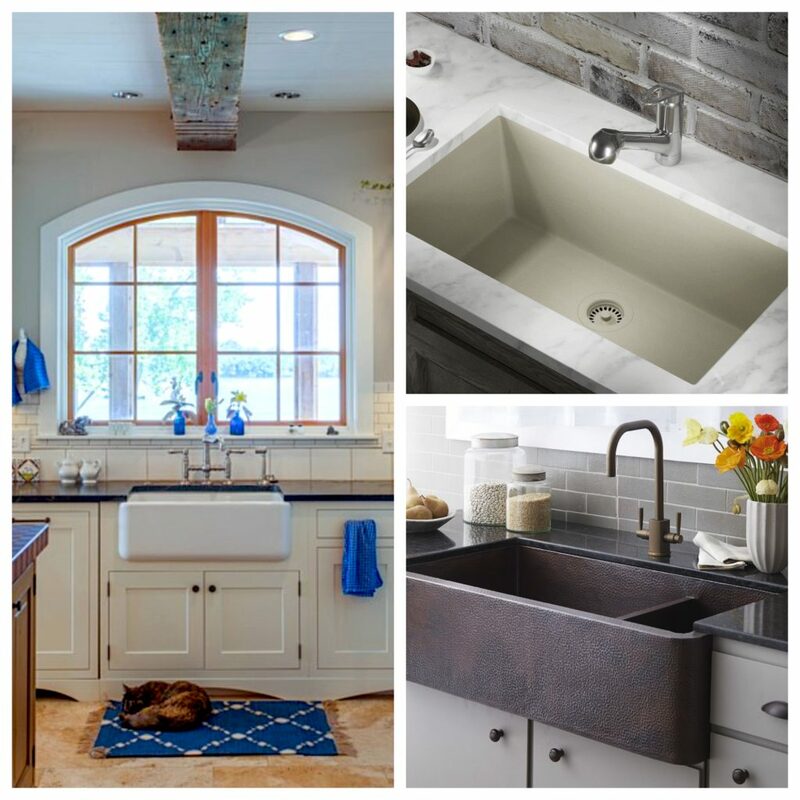 From farmhouse-style sinks to sleek, 32-inch long by 17-inch deep inset stainless styles with apron front detailing, there are larger options to complement any kitchen design. 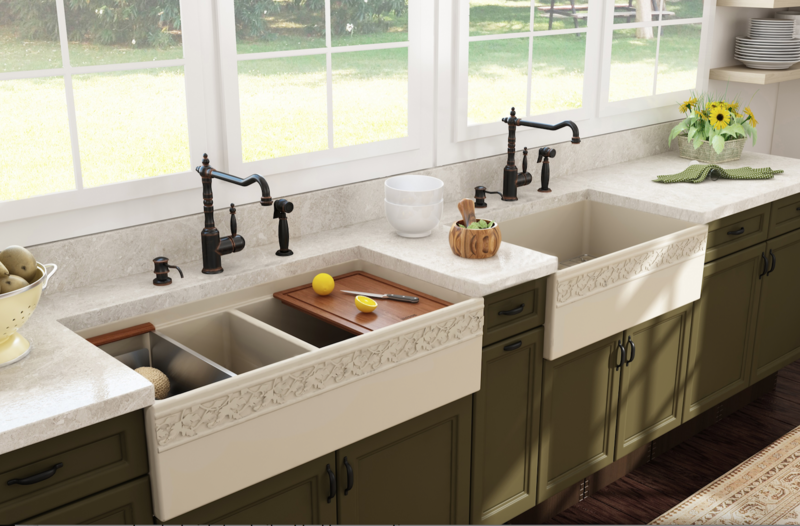 Another wise choice is to add a second smaller or prep sink with a garbage disposal to your kitchen island for ease of workflow and quicker clean-ups. You can also place that second sink in a butler’s pantry (more info coming in our monthly newsletter) or in that separate cocktail area mentioned above. Are you up for a kitchen remodeling challenge? Call 314 Design Studios today to schedule a no-cost consultation (410) 643-4040, or feel free to drop-in at your convenience. Here are 3 ideas to help make bath time for “Bowzer” more of a breeze! 1. 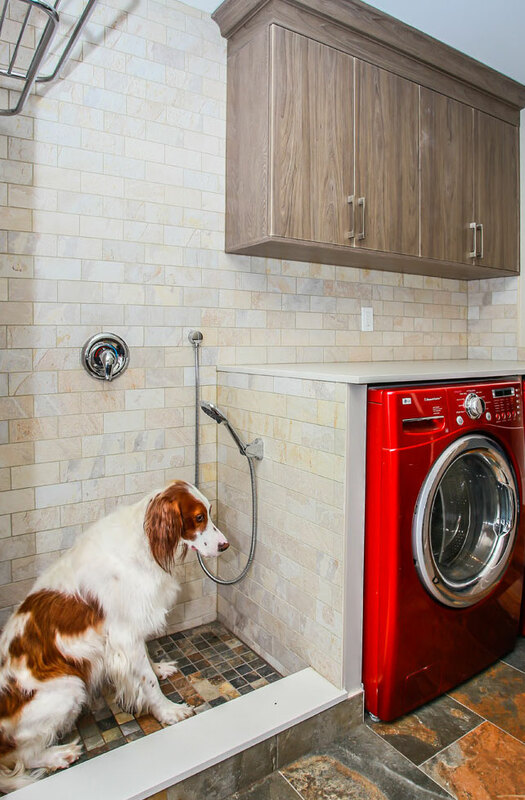 If you’re building a new home or are already considering a bathroom, laundry or mudroom remodel, you might want to use the opportunity to install a dedicated dog wash station. Your designer will work with a plumber to install the proper basin or shower pan, drain and fixtures. 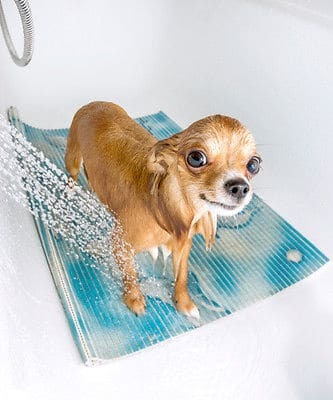 A tile professional can help create a practical yet polished surround for your pet’s bathing area. If you go the step-in shower route, it should be outfitted with at least a curb to keep water from splashing out. 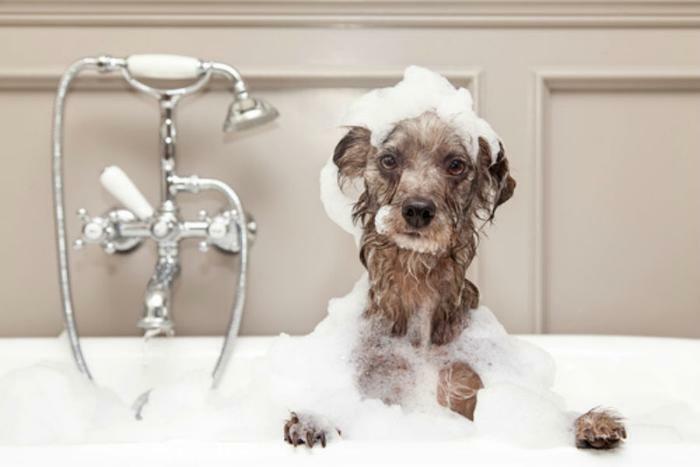 If you have a very well behaved dog you may be able to skip installing a glass or other type of panel to control splashes, but experts generally recommend adding a short shower curtain or glass wall. Talk to your home designer about incorporating storage aspects into the design above and aside the shower area so everything you need can be easily accessible. 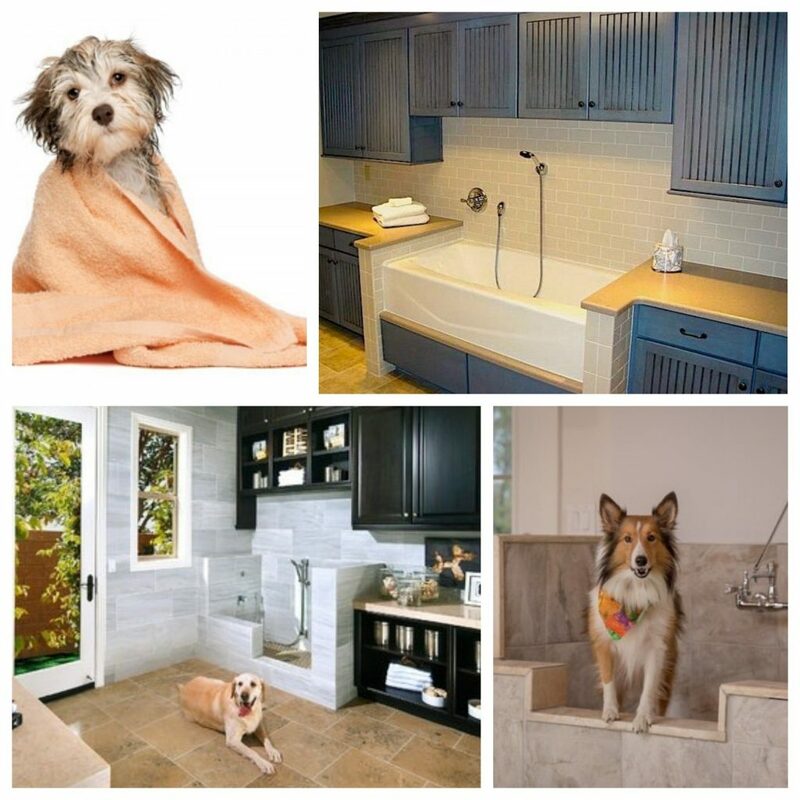 Ready to make your bathroom more pet-friendly? We’re here to discuss your ideas. Call 314 Design Studios today to schedule a no-cost consultation (410) 643-4040, or feel free to drop-in at your convenience; we are located at 314 Main Street in Stevensville, MD 21666, and open from 8 am – 4 pm, Monday through Friday. It’s no secret that the kitchens that evoke the most convivial environments have at least one thing in common, a stylish island that offers both panache and purpose. While some more pleasing attempts at “island living” were introduced in the ‘60s and ‘70s, today’s kitchen islands have their roots in those larger rectangular structures that took center stage in America’s kitchens in the ‘80s and ‘90s. And back then, in the land of the big, bigger and biggest, one might argue the primary purpose of an island was to help fill or connect space in the late 20thcentury’s largest kitchens. It’s a beautiful thing now that we have come full circle and have figured out how to better use this wonderful device for productivity and gathering in a way that’s totally 21stcentury. Beyond being breakfast and homework central, islands have evolved in how they are laid out, what they are made of, how they are styled and constructed, and how they are situated within the kitchen space. However, non-standard islands are making their mark on kitchen culture and making their way into spaces you wouldn’t necessary think would work for an island. These three newer trends do, however, because they were well planned for and well executed. So talk to your qualified design team if you’re planning a new home or just a new kitchen. By adding a triangle-shaped portion of marble to a rectangle portion, you create a more interesting aspect of design to the kitchen. In addition to the extra seating this approach provides, it adds a wow-factor to the room’s aesthetic that a rectangle alone just can’t do. This design makes the most of the existing space without sacrificing flow or style. Indeed, both wine and appetizers are all that are needed to get a party started when you have a sensibly styled showpiece like this one. It’s also a winner when it comes to extra storage, entertaining space and a dual-level approach to the countertop allowing for simultaneous prepping, conversation and noshing to be going on. Exactly what you want and need your kitchen to do! Excited to get started? Call us today to schedule a no-cost consultation (410) 643-4040, or feel free to drop-in at your convenience; we are open 8 am – 4 pm, Monday through Friday.314 Design Studio is located at 314 Main Street, Stevensville. Days out on the boat, fishing dockside with the kiddos, and afternoons by the pool are wonderful Chesapeake endeavors that are best followed up with a refreshing shower once back on dry land. Here are three reasons why you may want to re-think where you are taking that shower. With all the attention being paid to our alfresco living spaces, it is only logical—and at times, more practical, to have that facility incorporated into your outdoor living scheme. Not to mention, all the sand and other land particles that WON’T make it into your house, if they’re washed off outside first. #lessmess! 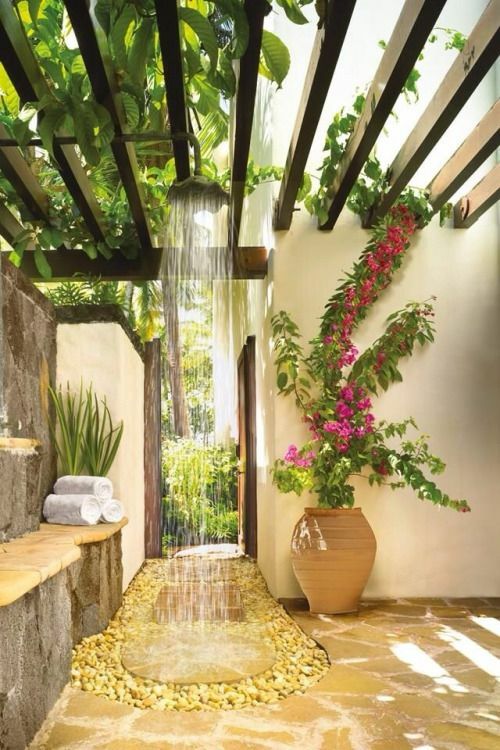 Beyond convenience, installing an open-air shower as a complement to your adjacent outdoor living areas provides another chance to feel more in harmony with nature and enhance your sense of well-being with its inherent spa-like vibe. 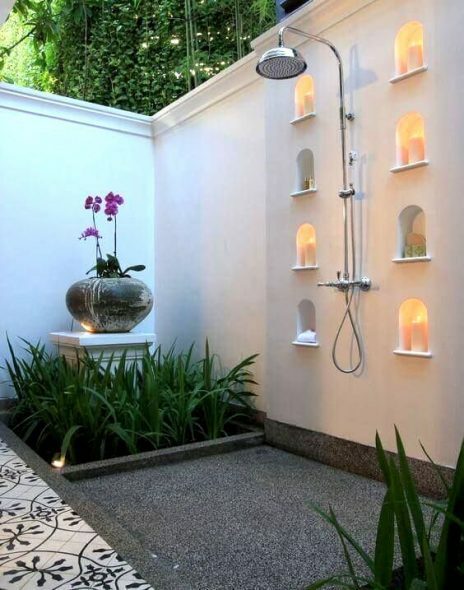 Creating an outdoor shower experience on your property, can also give you an opportunity to flex those creative bones and style a space that adds to the overall aesthetic and enhances your property’s amenities and value. With the variety of materials including treated real woods, stacked stone and amazing composite products that mimic the look of natural materials, you will have many options when it comes to designing the space. 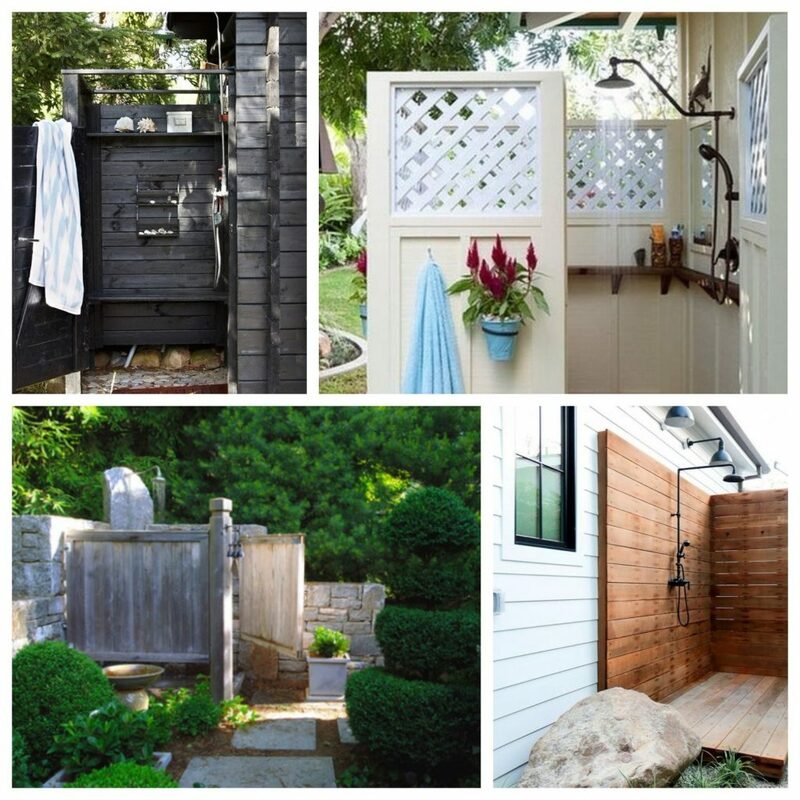 From rustic, to moody, to modern there are many ways to provide for both the privacy you will want to have with the aesthetic you find most pleasing. 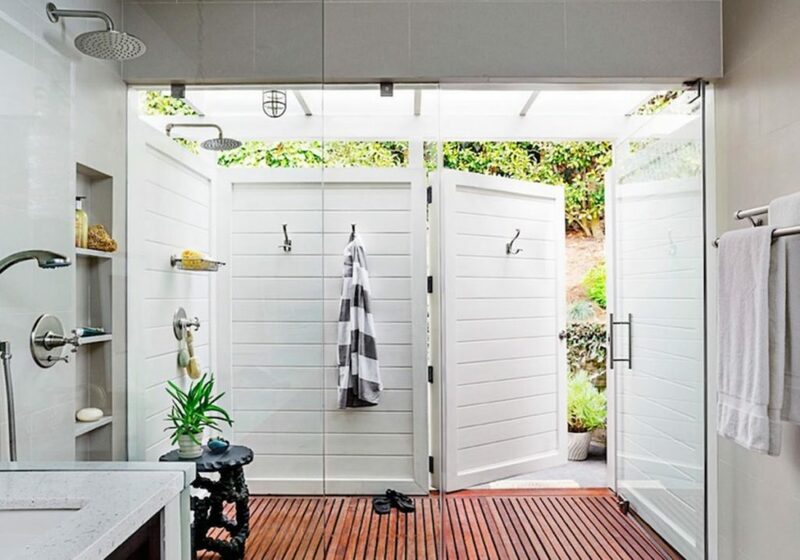 Want to discuss your ideas for an outdoor shower project with an expert? Our talented team of certified designers can help you assess your needs and then combine them with the right materials, fixtures, and creature comforts specifically designed for outdoor living spaces. Call us today to schedule a no-cost consultation (410) 643-4040, or feel free to drop-in at your convenience; we are open 8 am – 4 pm, Monday through Friday. Before you know it, summer will be here—and you know what that means when you live on the Chesapeake Bay—letting the good times roll outside and enjoying sun, fun, family and friends! 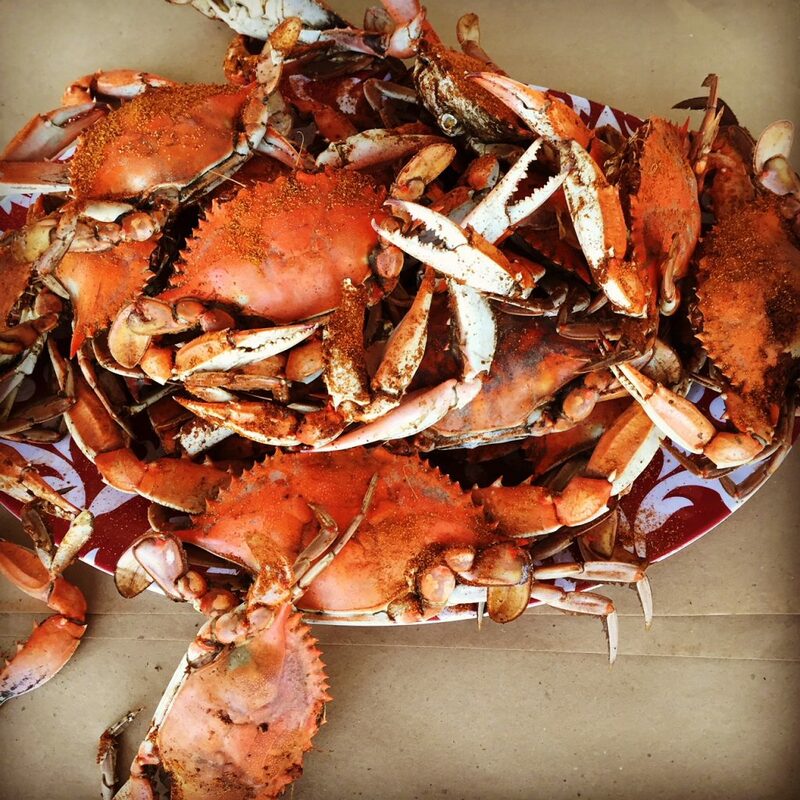 We’ll bet you cannot wait for fresh-caught Maryland Crabs and BBQs! While your appetite may well be ready for your first crab feast, can you say your outdoor space is? Fundamental to good Maryland living is enjoyment of outdoor living and entertaining. While outdoor design trends may have started with a simple charcoal grill and a beverage cooler, outdoor living spaces evolved in the mid-2000s as a most-wanted home feature, with many new home builds featuring outdoor kitchens integrated into patio and deck floorplans. Today’s outdoor kitchens are “next level” offering even more options with new materials, appliances and aesthetics to rival even our most urbane interior kitchen floorplans. 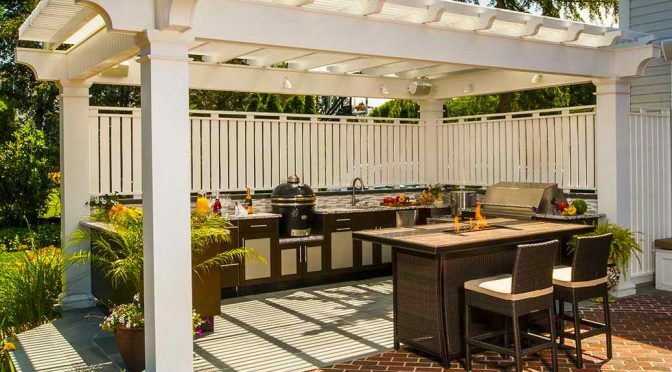 In other words, grab your biggest crab pot and get ready for your next summer on the Chesapeake with these outdoor kitchen innovations. While granite remains widely popular when it comes to indoor countertops, and stone is a wise choice for outdoor surfaces due to its durability, an innovative material that blends the glamour of the former with the weather-resistant qualities of the latter is now available in the composite category. This outdoor-rated composite is called DEKTON and is known for its strength and style. DEKTON withstands high temperatures, and resists stains and dinging from heavy utensil use. It provides the long-term durability aspect that is a necessity for enduring outdoor use. Those first-generation outdoor kitchens rarely strayed from using stainless steel when it came to outdoor cabinetry, and with good reason. Like stone, it is one of few options that is both weather- and termite-proof. 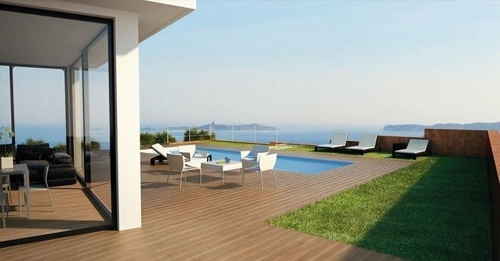 But manufacturers have added marine–grade polymers and teak options to the mix. 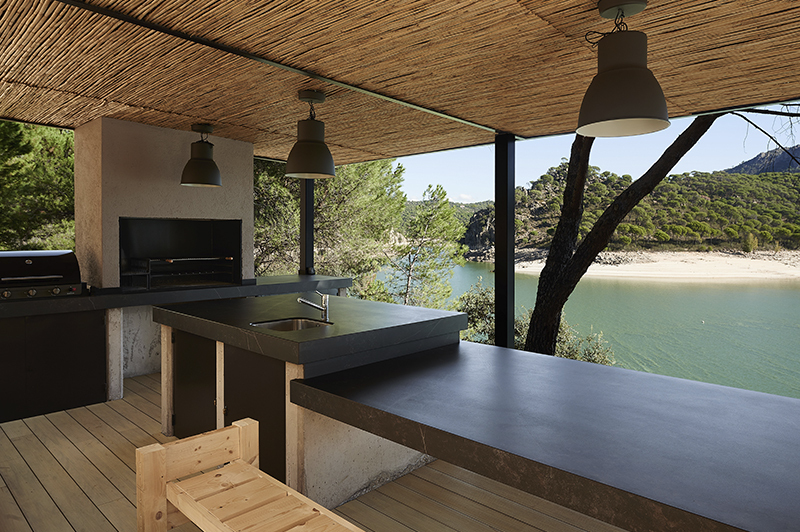 The marine-grade polymers are durable, easy to clean and come in variety of colors for customization and the use of teak can bring the woodsy warmth so many homeowners desire in a kitchen—even an outdoor kitchen. What is the biggest must-have item in the outdoor kitchen marketplace right now? The pizza oven! More than just a way to accomplish a quick meal, the pizza oven is giving families a unique, new way to connect and create fun quality time. 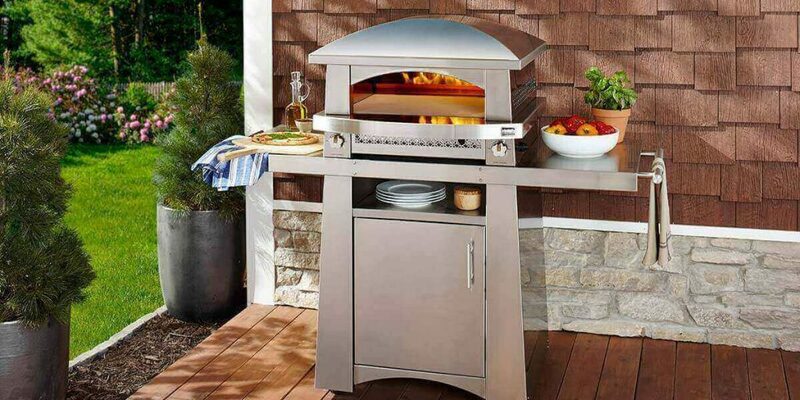 Outdoor pizza ovens come in a variety of materials and sizes, free-standing and built-in, and in every type of style from modern to rustic. Other items that families are asking for and are available now are smokers, flat cook tops, and better storage options. Industry leaders predict the next big trend will be outdoor heaters; a great item to have for those cooler Bay breezes and to extend outdoor kitchen use beyond the summer season. The objective is to provide more options that appear less obtrusive and blend better with our outdoor kitchen surroundings. Creating a seamless transition from the inside of your home to your outside property is the priority in aesthetics today. Design and build options are available that open up a space so much that you can walk through the front door of a home and see a vista of the outdoors uninterrupted by drywall. Imagine your Bay area home providing that type of view. To achieve uninterrupted site lines between indoor and outdoor spaces, 314 Design Studio experts recommend level floors with seamless room transitions and utilizing flooring materials suitable for indoor or outdoor spaces. Today’s porcelain floor tile options that mimic wood and stone provide the option for opulence because they look just as beautiful indoors as they look outdoors. Both wood and stone-look options are available in many varieties to complement any décor and help create the wow factor of the seamless look. 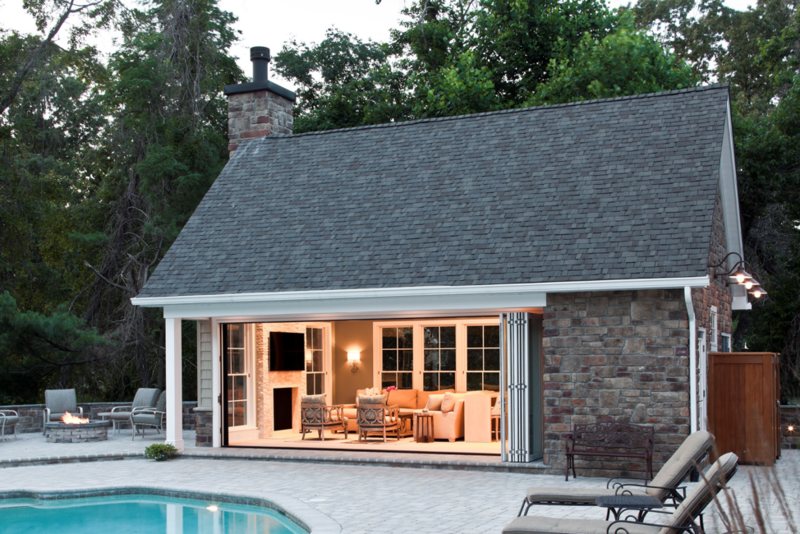 This four-season, 500 square foot Cape Cod style pool house was designed by architectural designer, Bob Moreland and built by Lundberg Builders. The exterior mixes a stone front facade and vinyl siding to match the original home, a custom-built cedar outdoor shower and attached storage area. The interior includes a cozy wood burning fireplace with a stone tile chimney facade, a limed-oak ceiling, porcelain ceramic tile flooring for durability, and a LaCantina folding wall system. The folding wall system is a fantastic way to connect indoor spaces to your outdoor living space. 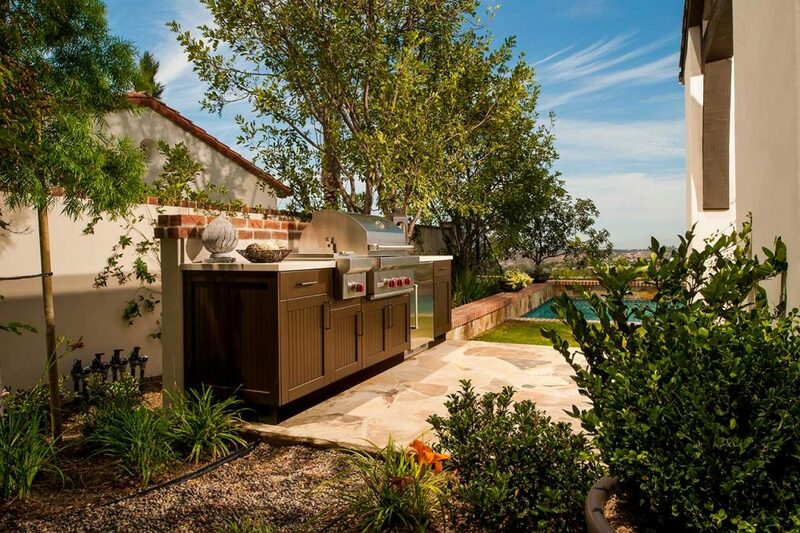 Do you have an idea for an outdoor kitchen and living space you would like to discuss with our designers? Our talented team of certified designers can help you assess your needs and then combine them with just the right materials, appliances and creature comforts to create a space that not only maximizes function and form but also blends substance with your unique sense of style. Call us today to schedule a no-cost consultation (410) 643-4040, or feel free to drop-in at your convenience; we are open 8 am – 4 pm, Monday through Friday. Carrara marble, ceramic tile, natural stone—all the beautiful materials that create today’s most appealing and sophisticated bathrooms—are also all the things that can leave your space feeling cold and austere if you’re not careful. 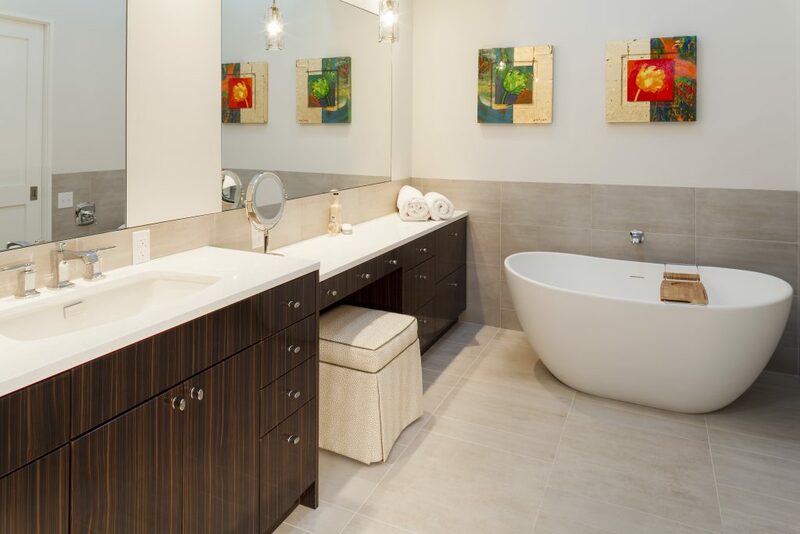 Fortunately, there are plenty of options and work-arounds you can discuss with your bath designer prior to construction or remodeling to ensure you are creating the warm and inviting sanctuary space you need with all the materials and finishes you want. While a hot bath in a traditional tub is surely a relaxing and rejuvenating experience, upgrading to a soaking tub allows you to submerge several more inches of your body in pure warm, aquatic bliss. Many homeowners have embraced this trend just for the enhanced opulence these tubs add to a room, but when you factor in the additional depth per soak, you gain the max benefits of form and function from your fixture. 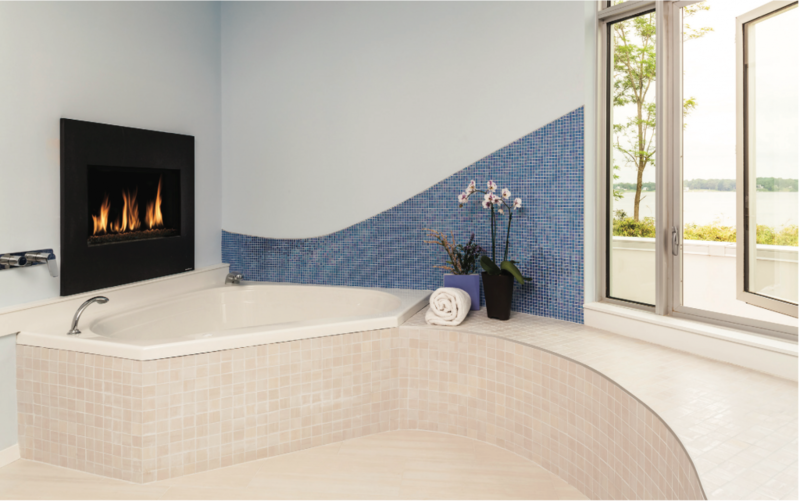 Jetted or whirlpool tubs are another option with added benefit. Although they have been around for some time, the latest iterations of these fixtures create more than just a balmy, bubble bath. Today’s models offer options like hand-held shower features, waterfall lights and even luxury cushioned headrests. In-model heaters can also make sure you don’t have to run additional hot water while you’re enjoying your hydro massage. What will they think of next? Optional TVs? Oh, yeah—they already have that! Isn’t any shower with hot water a “steam shower?” Surprisingly, no. A steam shower combines the best of the shower experience with the benefits of a sauna. The enclosed and controlled environment of the steam shower produces water vapor that surrounds the body with the help of a humidifying steam generator. 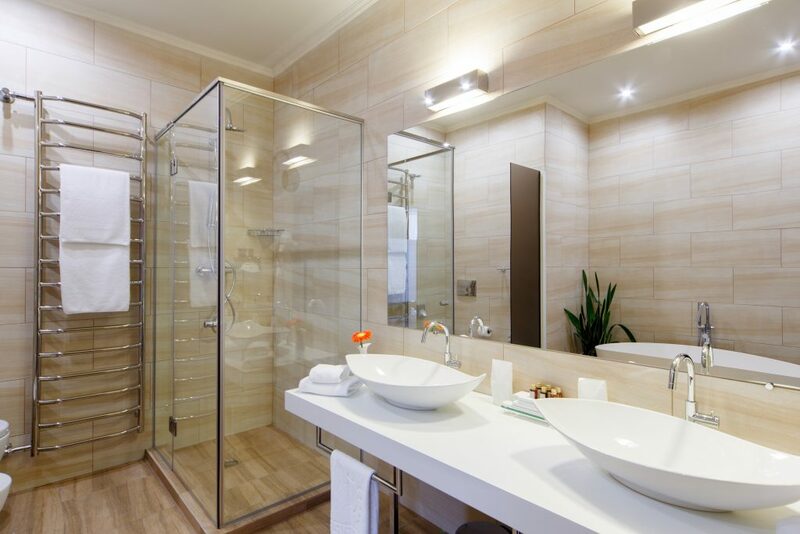 The health benefits of steam showers are numerous. They include increased circulation, cleansing the body of toxins, enhanced recovery from exertion, and stress management. Steam showers can also improve the complexion by opening your pores to promote clear skin. Remember the last time you had sore muscles and then think about how much better you would have felt if you had a steam shower to step into for instant relief. Knowing that your porcelain god could be ice-cold when you need to use it in the middle of the night can send shivers up your spine. Fortunately, the evolution of our home thrones has been quite dramatic—a far cry from earlier versions of seats with plastic cushioning —today’s models offer smart technology with quiet-close lids, flushing and freshening devices, and wonderful, glorious warmth; some 20-plus degrees above room temperature, if you like. Prices vary widely depending on which features are must-haves for you, but warmer experiences are possible for less than $200 per throne. Heated Towels = Happy Bodies! Europeans have known this concept for years; even modest hotels abroad offer this as a standard bathroom appliance. When it comes to home appointments, these handy accessories have expanded to include a variety of finishes and sizes, and offer wall-mounted or free-standing styles. While you will need to exercise extra care with young children in the home, in general, towel warmers are specifically designed to operate at a maximum temperature between 100 and 150 degrees to provide the best towel-drying benefits without being a fire hazard. Talk about happy feet! Heated floors provide an extra heated layer between the ground and your ten tootsies which can be a game changer in winter. Even in warmer climates, cold tiles can be an issue—it’s just the nature of the material. 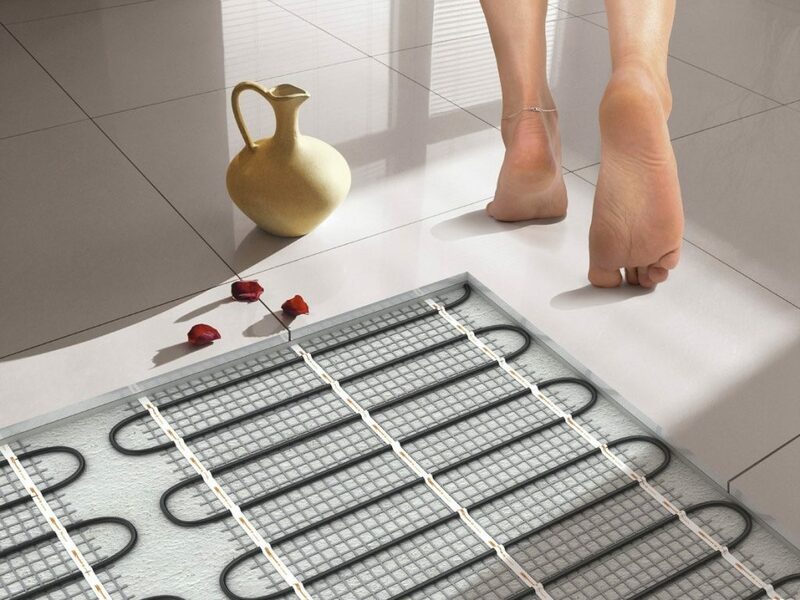 Heated floor systems, which are either electrically based or use hydronics (heated water circulating through a system of tubing in the floor), are energy efficient and can actually help save money over time. Cost per square foot varies per region, but you can ask any homeowner who included this feature in their build budget, and they’ll tell you, it was worth every penny. 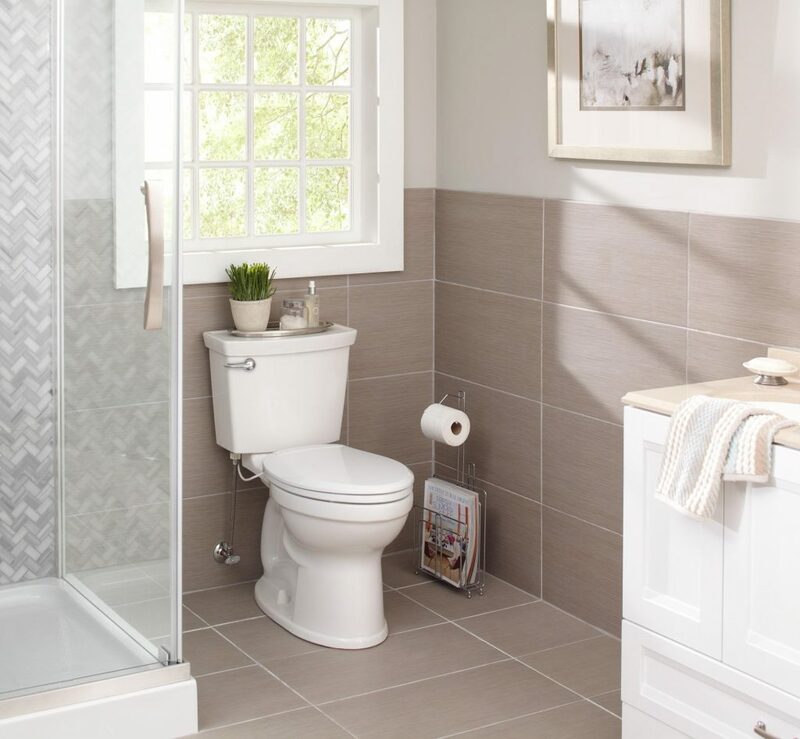 Want to create a bathroom that is as comfortable and convenient as it is beautiful? Our talented team of certified designers can help you assess your needs and then combine them with just the right materials, fixtures and creature comforts to create a space that not only maximizes function and form, but blends substance with your unique sense of style. Call us today to schedule a no-cost consultation (410) 643-4040, or feel free to drop-in at your convenience – we are open 8:00 am -4pm Monday- Friday. We asked some of the region’s best hosts for their favorite kitchen design ideas for holiday entertaining. Significant planning is required for flawless, memorable parties for guests and hosts alike. Having a kitchen that is designed to support guest interaction, food prep, storage and serving top the list. 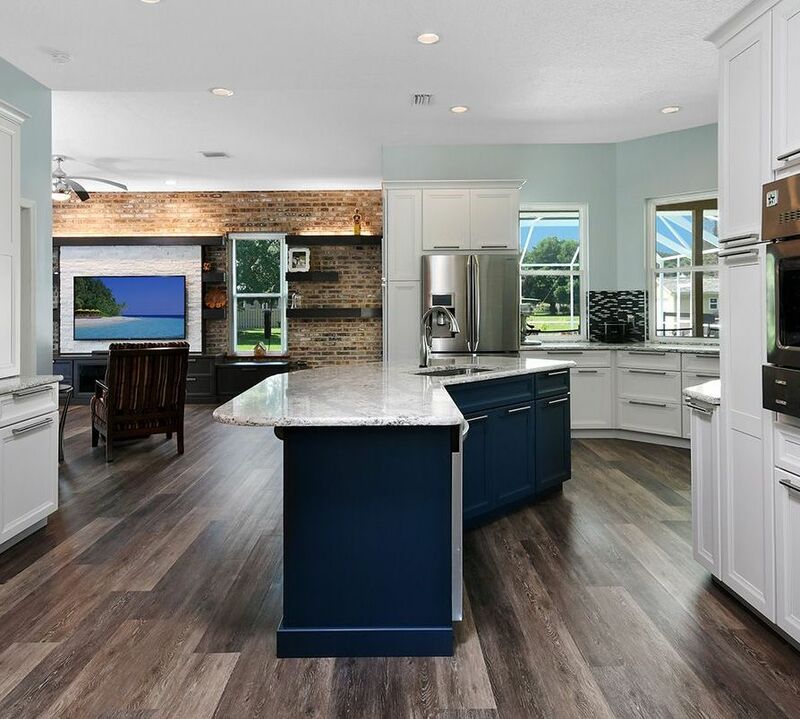 1) Practical Design Layout – Open floor plan concepts offer sight lines that connect the kitchen to dining and serving areas so hosts can still enjoy their guests while preparing foods. 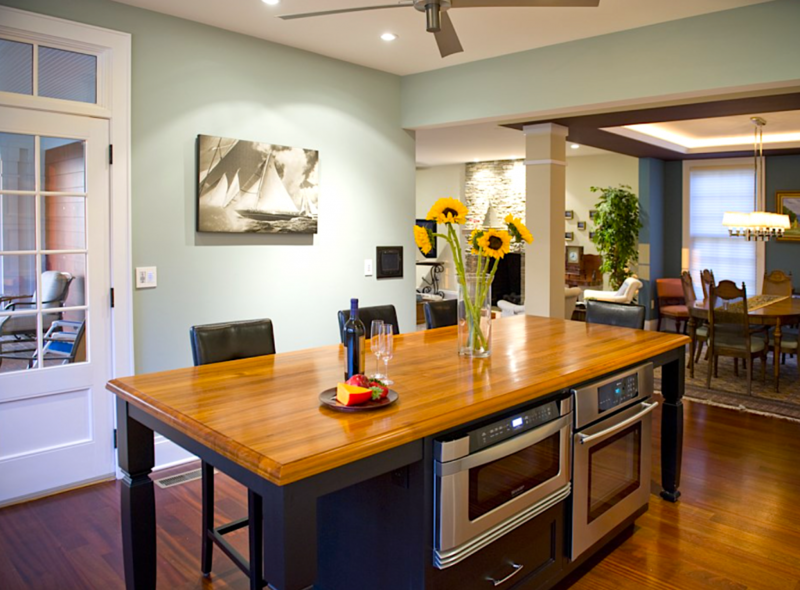 2) Ample Work Areas – Have you ever noticed how everyone wants to gather in the kitchen? 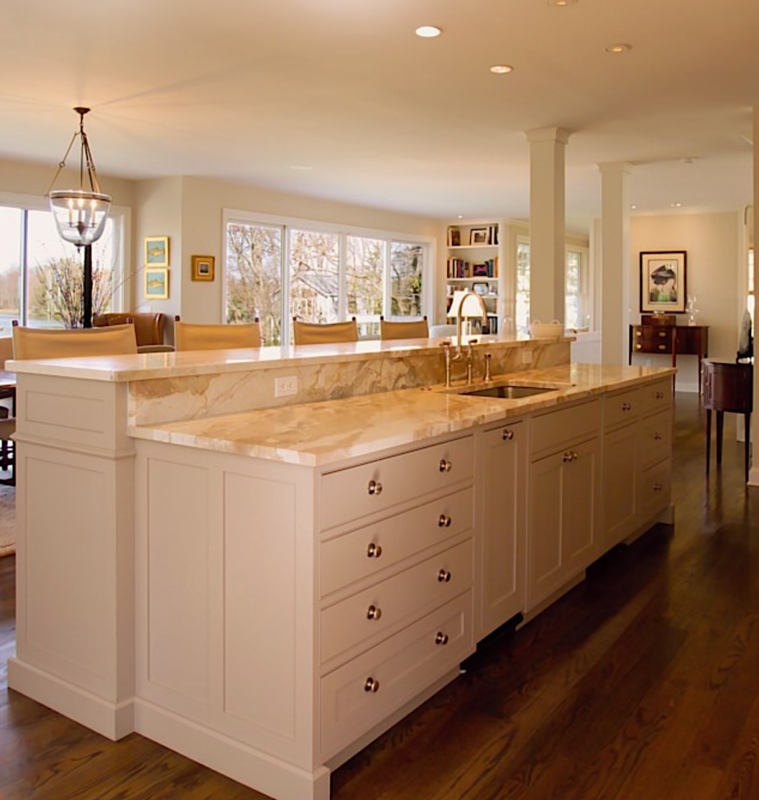 A large island is a host’s work-horse that adds essential space for food prep and serving. Island stools offer guests seating while keeping them away from kitchen traffic and congestion and the danger of hot dishes and pans coming out of the oven. 3) Attractive Built-Ins– Buffets, sideboards and strategically placed cabinetry can be built-in to offer room for laying out a spread of utensils, plates, appetizers and desserts with plenty of room for decorations and the personal touches that make a space inviting. Glass fronted cabinetry offers a pretty place to display china. 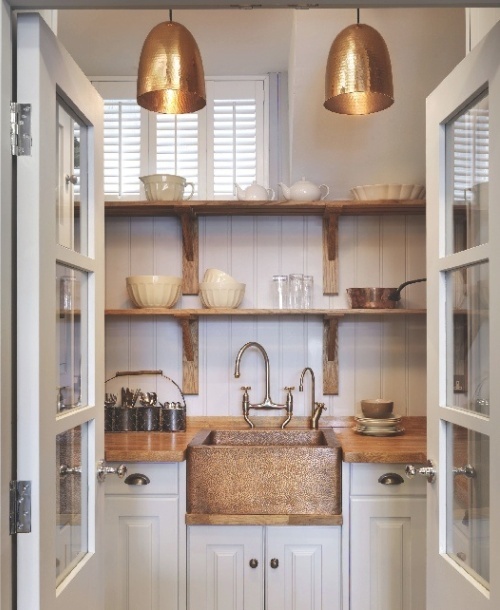 4) Themed Organization –Design your kitchen to create serving “stations” such as a coffee station, breakfast bar, or cocktail bar that corral items by theme – specific utensils, serving ware, stemware, barware, small appliances and ingredients for convenient all-in-one access. 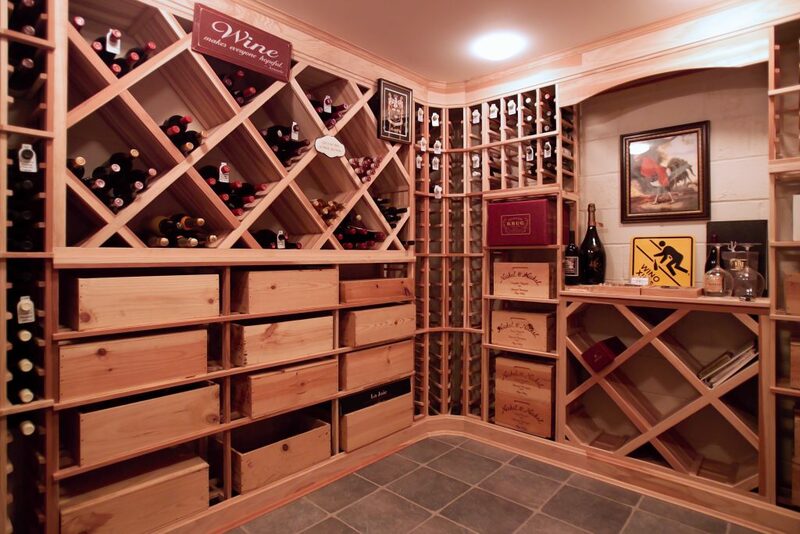 Below is a whole room designed for a client who loves to enjoy their impressive collection of wines with their guests. 5) Butler’s Pantry – A butler’s pantry keeps the mess out of sight and allows hosts more room to store larger sheet pans, serving trays, or seasonal china instead of having to pack it up and haul it out for each use. It’s also a great place to store canned goods and other pantry staples and provides more utility space for mixers and other large appliances. Budget permitting you could even include a second dishwasher and/or a utility sink to wash dishes and prepare cut floral arrangements! With virtually endless options, designing a kitchen can be a daunting process to undertake on your own. With years of experience and hundreds of happy clients served, our certified kitchen and bath designers can help you bring your ideas to life with less stress. 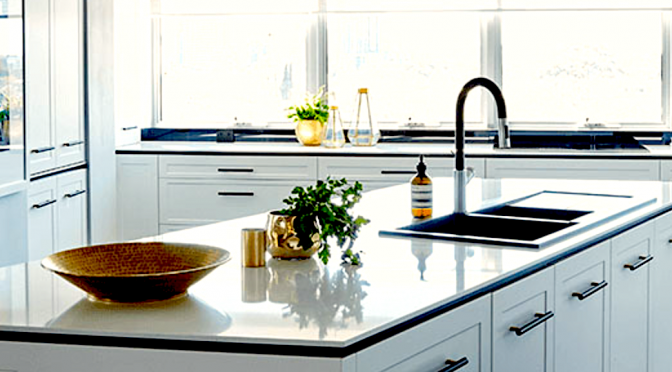 Whether you are looking for the latest top-of-the-line trends and features or you need value engineered options, from concept to build, we will guide you in selecting the right countertops, cabinetry, appliances, and finishes to create a practical and beautiful kitchen. Call us today to schedule a no-cost consultation (410) 643-4040, or feel free to drop-in at your convenience – we are open 8:00 am -4pm Monday- Friday. June 5, 2017- 314 Design Studios, a boutique kitchen and bath design studio, has won What’s Up? Magazines Best of the Eastern Shore 2017 readers poll for ‘Best Kitchen Designer and Kitchen and Bath Remodeling’. 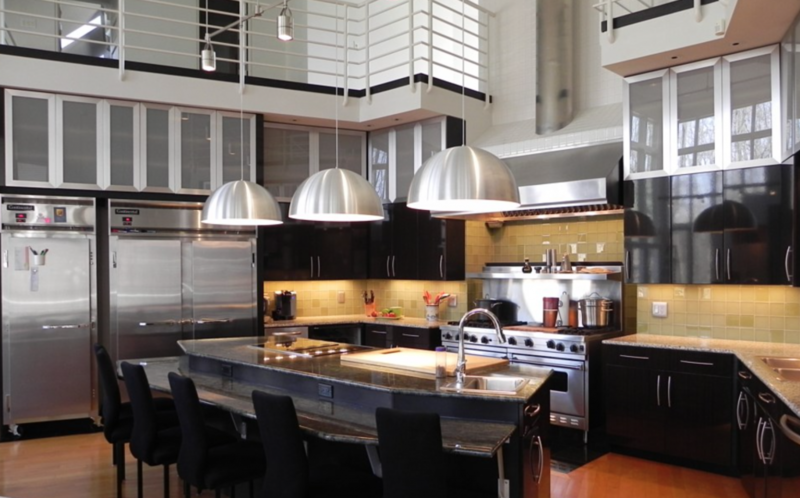 The kitchen and bath design studio are well known for their exceptional designs, extraordinary customer service and unparalleled craftsmanship. 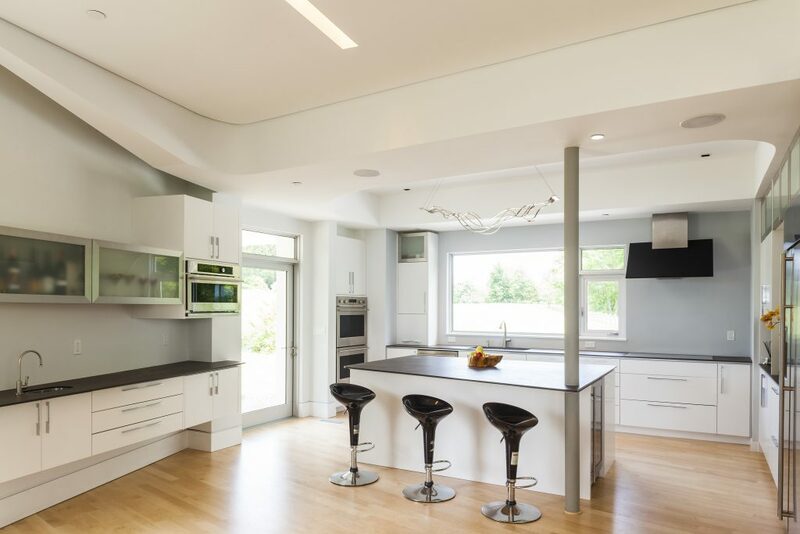 They have also recently won the ‘Best of Houzz Design and Customer Service Award’. Winning these awards further confirms 314 Design Studio is a company with the highest standards of craftsmanship and industrial excellence. 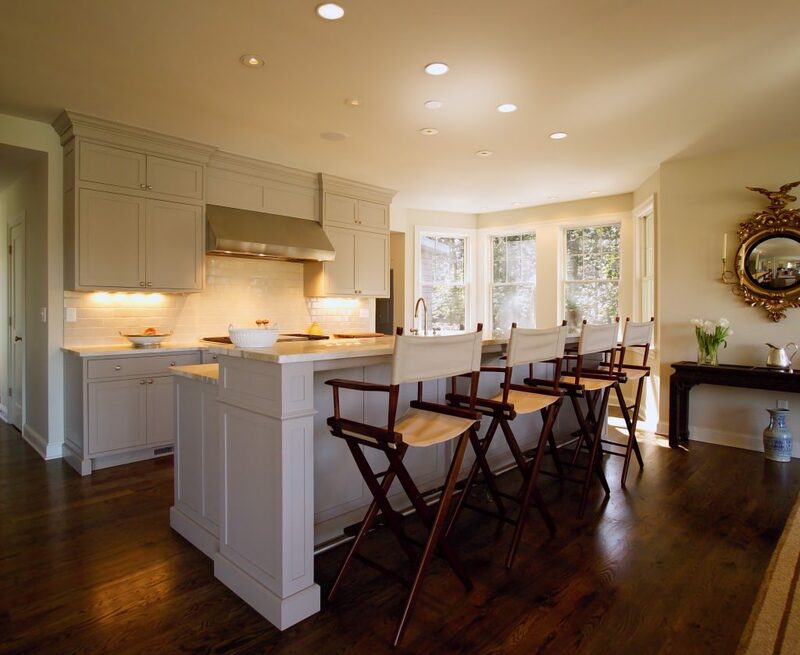 The company designs and remodels kitchens, bathrooms, closets, laundry rooms and other spaces throughout the Eastern Shore, Annapolis, Kent Island and other areas. 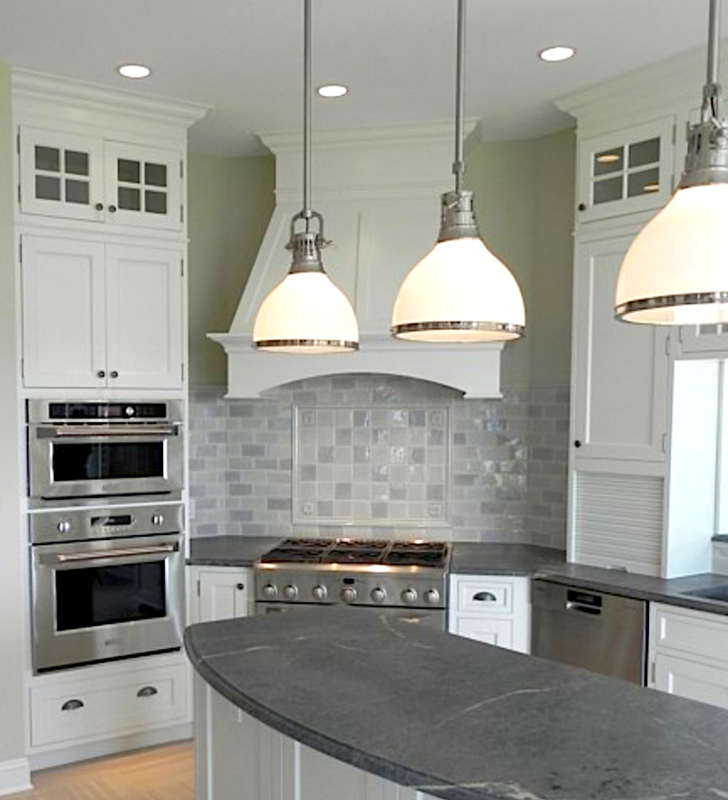 They have two kitchen and bath showrooms located in Stevensville and Annapolis, MD. 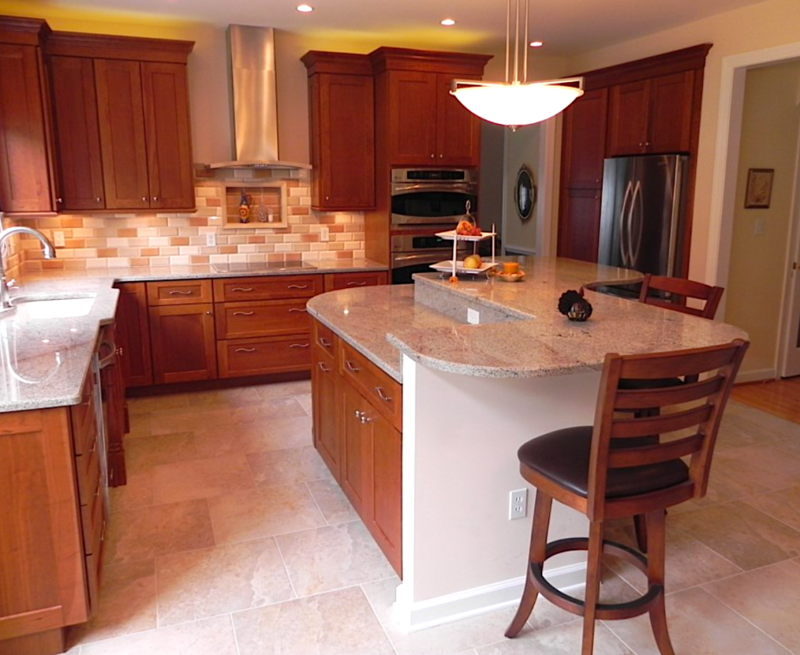 There you can view a selection of fine cabinetry, countertops, knobs and more. 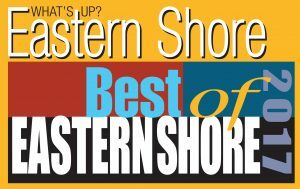 Every year What’s Up magazine asks their readers to cast their votes for the best businesses, law firms, spa services and medical professions by submitting an online ballot on whatsupmag.com. 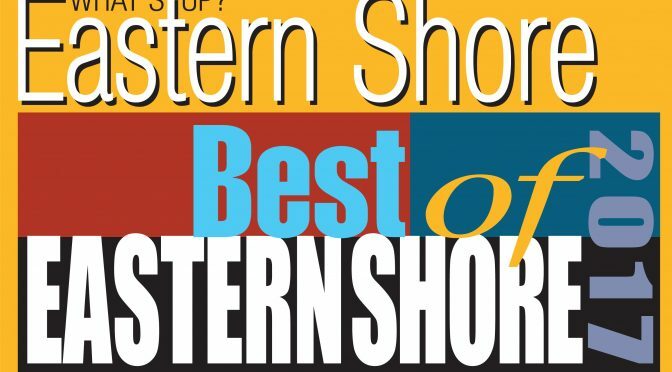 The winners will be honored at the annual Best Of Party held on June 15. Our clients receive the finest personalized service from an experienced design team who will help turn your vision into reality. Whether you want to create a new space or simply beautify an existing one, our designers will assist in transforming your kitchen, bath, home office, library or any room in your home into the space you have envisioned. Our studio is filled with samples of fine cabinetry, tile, countertops, fixtures and accessories. We are proud to support the work of local artisans and craftsmen and are the exclusive representative of quality cabinet lines.